Your wedding day is supposed to be one of the most important days of your life. It is a day you’ll remember forever and hopefully something that you’ll only do once. However, wedding trends in recent years have seen many ‘big days’ become all too familiar. If you’ve been a wedding guest in recent years, then it is likely you’ve experienced this first hand. Too many modern weddings are slaves to tradition and a set idea of what a wedding should be. Your wedding day doesn’t have to be like this. Instead, you can embrace a number of unique entertainment options to ensure that people remember your wedding as a great day, rather than one that was the same as all the others. Here are some of the best ideas you might consider. Hiring a live band to play at your wedding doesn’t have to be the disaster it might have been at your graduation ball or school-leaving prom. As long as your able to find a ‘grown up’ band who have more to their repertoire than playing party classics and sounding like a karaoke evening gone wrong, then you’re sure to have a great time. As well as the experience of having a band, it is a refreshing change on the usual wedding DJ's who will turn up and play predictable tracks. While your wedding doesn’t have to be about putting on a show, there’s nothing to stop you employing other people to do that for you. Hiring professional dancers will be another refreshing change to the usual wedding entertainment we see, and you could go for whatever type of dancers you want, with belly dancers a particular favorite, particularly among those who love to get involved themselves! 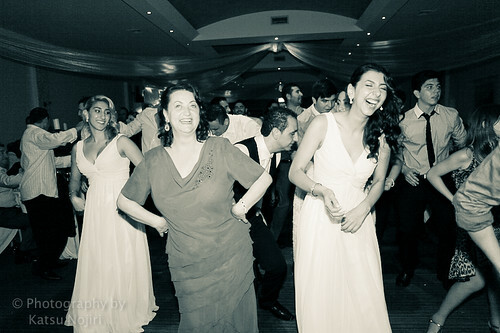 You could also hire a salsa instructor to hold an impromptu dance class during your wedding party, although you’ll then need to make sure that the music fits the moves! Firework displays are a popular feature of many weddings, both after the ceremony itself and later during the evening. Rather than get the wedding venue to take care of the fireworks, or commandeer a relative to hold a display, it might be worth hiring a professional display company to do it for you. This isn’t as expensive as you might think it would be, and they’ll be able to bring along the perfect range of fireworks to capture the essence of a wedding day brilliantly. The best ones will even liaise with the venue and organize everything from beginning to end, meaning all you have to do is instruct them and then let them get on with it. Barbershop singers aren’t for everyone. In fact, they’re probably as far into the ‘love them or hate them’ category as it is possible to get. However, if you love them, then they’re a great alternative to a band or other entertainment options that you might have considered. Whatever entertainment you book for your wedding, make sure it is something you and your guests will enjoy and that it will make your day live long in the memories of all who attend. Daisy would love to be a wedding planner but cannot afford to give up her current job. She does, however, often help her friends and relatives plan their weddings, advising on everything from which quality fireworks to buy to the wedding venue and decorations.